This has certainly been a wild summer. I mean that literally. John and I love taking our bikes on the local trails and spending a few hours riding around , then having a picnic at our secret spot by the St. Mary’s River. It’s actually more of a secluded clearing in the brush that leads out to the rocky edge of the river , with a lopsided picnic table . This is how we like to spend our summer days. Well this summer has been a little different so far . A few weeks ago we took off on our bikes as usual, riding on the street part of the way , before entering the bike path. As we were approaching the path, we noticed a few cars pulled over and a small crowd of home owners out on their lawns gathering together. I couldn’t quite see what was going on until I got a little closer , then I saw it . 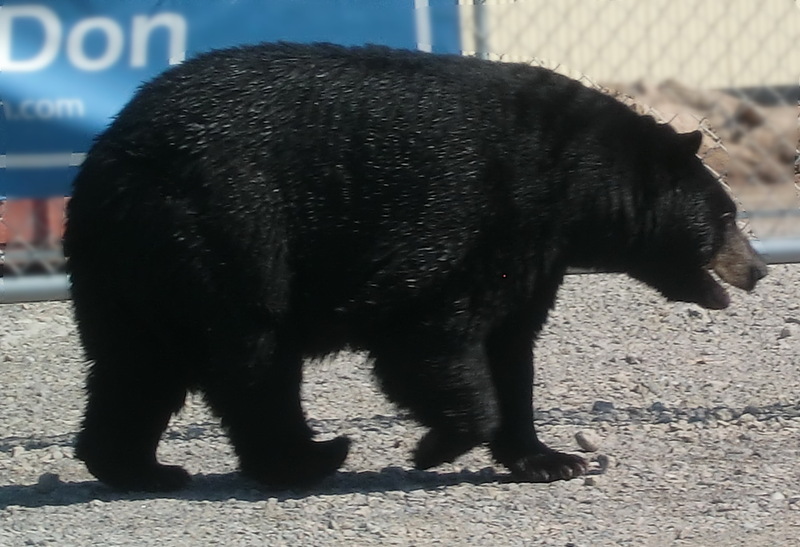 A big hot and bothered Black Bear, just wandering down the sidewalk in a residential area of town. I didn’t know whether or not to turn and ride the other direction or to stop and get out my camera. So I picked the latter . Only I couldn’t really stop because the brave side of me wanted to get right up close , like a news correspondent on a mission in enemy territory. I swiftly jumped off of my bike , and grabbed my camera from my bike bag, and while holding the camera in one hand I rode up slowly so I could get ” The Shot.” Now how close is exactly too close when it comes to Black Bears? I really haven’t looked into that, and maybe it would have been a good idea before taking on such a spontaneous act. I made it to the middle of the street and the bear was strolling down the sidewalk like a pedestrian on his way to the market on a hot summer day . His coat was shining from I’m guessing sweat or water from a local stream . He was walking with his head down and panting like a dog with his big pink tongue hanging out of his mouth. It was a hot day in the Soo , and I’m sure the pavement felt like hot coals on his cute furry feet with their sharp long nails. I held onto my handlebar with one hand and held my camera with my other hand and just aimed and started shooting in the general direction. There was no way I was getting off of my bike at this point in the game. I really don’t know how fast a Black Bear can run , and I sure don’t want to find out . My bike veered a little closer, and as it did , he turned his head ever so slowly and actually sneered at me bearing his teeth and everything. At that point , I took my cue and moved on to the other side of the street, to join the crowd that was gathered and conversing on the sidelines. Poor hot bear continued his journey back into the woods , and on to a cool forest stream to cool off from the heat of the day. The crowds dispersed, and John and I continued on our journey on the bike path . Not two minutes on the trail , and what do we see ? 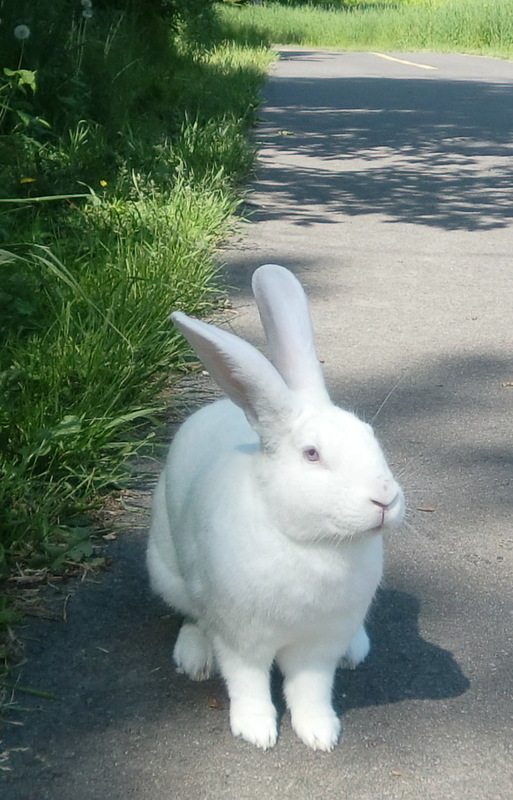 A big white rabbit just a walkin down the path like he owned it. What a strange day. The following day we bought some bear spray to keep with us , just in case we meet up with our friend again. This entry was posted in Motley Musings by Ginger Smoothy and Otto Pilot. Bookmark the permalink.